BROWNSVILLE — After weeks of sealed events and sealed orders, public filings in the case against former Tamaulipas governor Tomas Yarrington shows the next court hearing will be in Houston, not Brownsville. 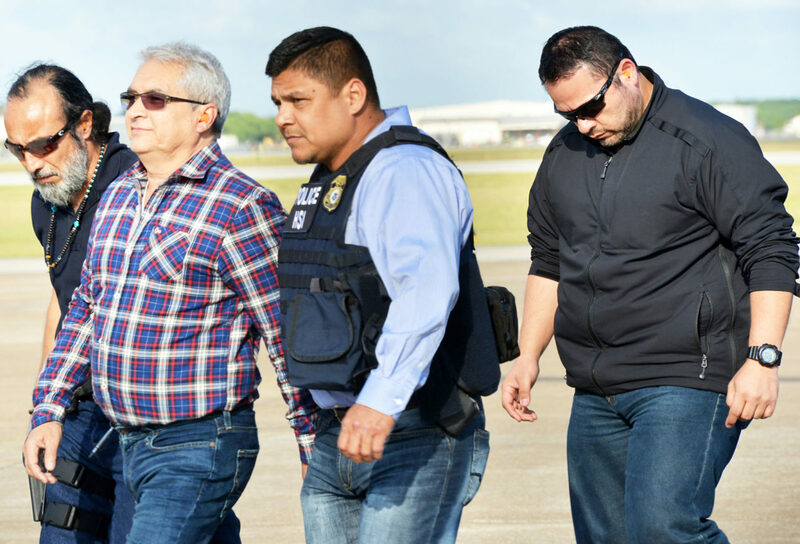 The United States extradited Yarrington, 61, who is also a former Matamoros mayor, from Italy in April to face charges levied in a 53-page, 11-count indictment that accuses him of racketeering through conspiracies to possess and distribute large amounts of narcotics, as well as several money laundering and bank fraud charges. The former Mexican government official has pleaded not guilty. Yarrington had been on the run since 2012 when the Mexican Attorney General’s Office opened an investigation into allegations that he had ties with drug traffickers connected to the Gulf Cartel and its then-enforcement wing, Los Zetas. After his arraignment this spring, the last public filing that shed any light into the case was in early May, when federal prosecutors asked U.S. District Judge Hilda Tagle to certify the case as complex because the government has 100,000 pages of documents in an extensive file of evidence against the allegedly corrupt public official. “Due to the volume of discovery, the production process will be lengthy and complicated. There are currently over 15,000 digital documents consisting of 100,000 pages that will be made available during discovery,” the motion states. The public ruling that reveals the next hearing will be in Houston is responding to a sealed motion that asks Tagle to grant more time for discovery because of the complexity of the case. Tagle granted that motion Tuesday and set a motion hearing for March 28 at 9 a.m. The U.S. District Attorney’s Office, Southern District of Texas, did not respond to an inquiry asking why the hearing was in Houston and asking whether all future proceedings will occur in Houston. Since Yarrington’s arrest, there have been few public records except for a scheduling order and an Oct. 23 order to correct a filing mistake, but there has been activity. There has been a total of 10 sealed filings since April 5, 15 days before Yarrington arrived in Brownsville from Italy to face charges. There have also been a total of six sealed orders. The only real light into the government’s case against Yarrington, however, is contained in that motion to certify the case as complex. That motion states that the trial will involve extensive evidence, both oral and documentary, as well as evidence from numerous seizures and investigations. Federal prosecutors also have numerous witnesses, including some who are in other countries, who are anticipated to testify, according to the motion. Drug Enforcement Administration and the Internal Revenue Service. The indictment accuses Yarrington of crimes stretching a two-decade span. According to federal prosecutors, when Yarrington ran for governor in 1998, he began taking millions of dollars in bribes from the Gulf Cartel and Los Zetas, who later violently split from each other, to assure that police authorities in Tamaulipas would not interfere in the cartel’s illegal business. Between 2007 and 2009, Yarrington is accused of escalating his involvement in trafficking multi-ton loads of cocaine through a deal the former official allegedly reached with the Gulf Cartel and Beltran Leyva Cartel. According to the indictment, Yarrington helped arrange access for large cocaine shipments into the Port of Veracruz and received a percentage of each load. Yarrington is also accused of taking out fraudulent bank loans, stealing $60 million in pesos in public monies and being involved in illegal land deals throughout South Texas. The former official’s co-defendant, Alejandro Cano Martinez, 61, remains a fugitive. Yarrington has been ruled a flight risk and is being held without bond.